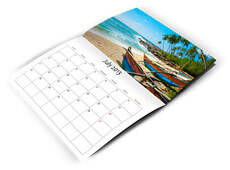 Try our calendar design services to get your calendars designed at a highest standard. Our creative design team will go an extra mile to make sure that your product looks amazing and contains enough information at the same time. If you would like to get a price or know more about this product and options, please don’t hesitate contacting us. Our products Specialists are always happy to answer all your questions and help you to make the right choice via phone, email or in person.